(16/37) TRENTON – A Department of Environmental Protection program that identifies redevelopment opportunities in New Jersey’s urban centers, is looking to the future to preserve an important part of Perth Amboy’s history – a 200-year-old English elm tree in front of City Hall, Commissioner Bob Martin announced today. 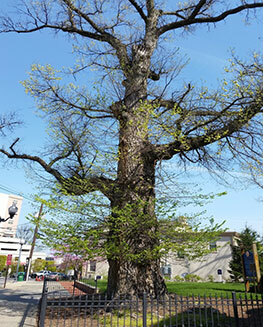 In February, a representative with the DEP’s Community Collaborative Initiative (CCI), who was working with Perth Amboy on various redevelopment projects, became curious about the aging and ailing tree and took it upon himself to begin researching ways to preserve it. CCI works to identify and promote environmental protection and redevelopment projects, as well as improve the quality of life in Camden, Perth Amboy and Trenton. After hearing about the tree’s history and value to Perth Amboy, Bill Lindner, DEP’s CCI Lead for Perth Amboy, contacted representatives with DEP’s Historic Preservation Office and State Forestry Services to see what could be done to preserve the tree. The tree is well past its maximum life span of 125 years and is in the last years of its life. 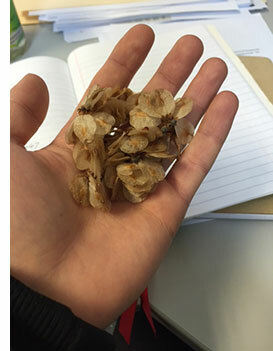 DEP’s Forestry Services contacted the U.S. Department of Agriculture and is now working with the National Center for Genetic Resources Preservation to collect seeds from the tree. The seeds will be sent to a USDA repository in Fort Collins, Colorado, where they will be cryogenically stored for 100 years. Genetic research and engineering also will be done to determine how to make this tree species and others resistant to disease. The English elm has a storied history. 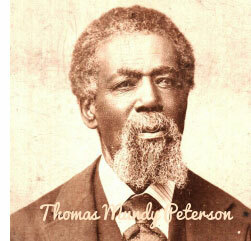 Perth Amboy resident Thomas Mundy Peterson became the first African-American to vote in the United States, on March 31, 1870, after the 15th Amendment to the U.S. Constitution granting African-American men the right to vote was ratified a day earlier. Peterson reportedly had stood under the elm tree before entering Perth Amboy City Hall to vote in a local election. In addition to standing witness to both national and state history through the centuries, this majestic elm has withstood the forces of nature. It has fought off disease multiple times, and survived heavy damage after the Perth Amboy City Hall roof blew off during Superstorm Sandy in October 2012 and hit the tree, requiring the removal of some branches. The historic elm is a source of pride for Perth Amboy, said Mayor Wilda Diaz. In 2013, the city solicited an expert to access the tree and propose measures to preserve it. With support from the public and City Council, almost $9,000 in City funds were used to help stabilize the tree and extend its life expectancy by as much as nine years. Even with the USDA’s involvement, DEP will continue pursuing all options to save the tree’s genetic history. Tree samples will be taken to the New Jersey State Forest Nursery in Jackson in an attempt to produce offspring from cuttings and seeds. The role of CCI in Perth Amboy, as well as in Camden and Trenton, uses a single DEP point of contact to bring innovative solutions to these urban centers’ complex environmental challenges. In 2013 the Christie Administration, with partner agencies in Camden, launched a series of projects to address environmental, health and quality of life issues. The success of that program led to the August 2015 creation of the Community Collaborative Initiative and expansion to include Perth Amboy and Trenton.